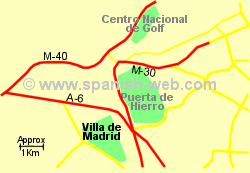 Founded in 1929, the Club de Campo Villa de Madrid golf course was designed by Javier Arana and is located on a 200Ha site on the north side of Casa de Campo, on the western edge of Madrid city. 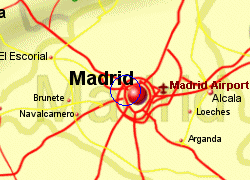 There are 2 18 hole courses, both par 70, with lengths of 4797 to 5886m and 4833 to 6011m. There is also a 9 hole par 3 course. Facilities include a driving range, putting green, pitching green, swimming pool sauna, 3 restaurants, and celebration facilities. The course has 36+9 holes. 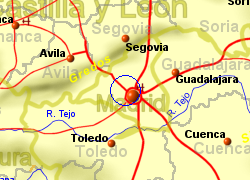 Map of the Villa de Madrid area.